The mystery in “Mr. Monk and the Critic” isn’t a who-dun-it. As with many Monk plots, who is obvious, how is the question. As far as that goes, it’s a great little mystery. This episode is perhaps more reminiscent of those in earlier seasons, but mainly it’s a showcase for Monk’s often neglected gal Friday, Natalie Teeger (Traylor Howard). She gets her figurative moment in the spotlight here and Julie Teeger gets a literal one. Natalie’s daughter Julie (Emmy Clarke) is a recurring character on the show, but we haven’t seen her since last season’s holiday special, “Mr. Monk and the Miracle.” Emmy first joined the show at the age of 12. It’s hard to believe, but now she’s all grown up and turning 18 this week (September 25th). She’s obviously decided to skip the awkward stage. She’s very poised… and unforgettable. The critic John Hannigan is played by Dylan Baker. Mr. Baker is a well known supporting player in films (Revolutionary Road, Road to Perdition, Spiderman 2 and 3) and television (Murder One, The Book of Daniel, Law and Order), as well as a Tony award nominated theater actor. 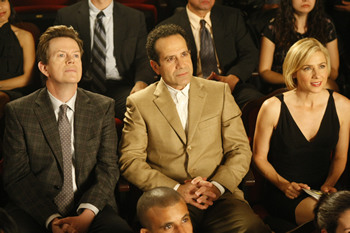 Like Tony Shalhoub, Mr. Baker attended The Yale School of Drama. As fabulous as it is that Monk can attract such a prestigious classically trained actor to a guest role, I’m also quite impressed and thrilled that they were able to cast a television icon for this episode: Bernie Kopell. He is no doubt best known for his nine years on The Love Boat as Doctor Adam Bricker and his recurring role as Siegfried in the 1960’s spy comedy Get Smart. I’m a big fan and it’s great to see him still so chipper at the age of 76 and still with a deft comic touch. However the episode really belongs to Natalie and Traylor Howard, who deserves the opportunity to shine. Traylor has described who she thinks her character is: “Natalie is a mom, making her protective. She’s bright, assertive, and patient,” and she added “She’s almost like a Nancy Drew.” It’s not often that Natalie gets to stretch her Nancy Drew wings, but when she does she really soars. She may not have Monk’s detective skills, but she’s got razor sharp intuition. For me part of the fun of watching Monk is seeing the exterior shots of San Francisco. Admittedly those are fewer and farther between each year, but they have a couple of pretty establishing shots in the opening scene: the city skyline at night and a shot of Columbus Street. That’s all you’ll see of the City by the Bay in this episode. The hotel exterior they cut to is definitely not in SF. Inside a man meets his mistress (Erin Cahill). When he can get a word in edge wise he makes her think he’s there to propose, lures her onto the balcony and throws her to her death. There’s some attention-grabbing camera work here, as we see through the killer’s eyes, which gives the episode that classic 70’s TV mystery feel. It’s meant to conceal the culprit’s identity, but one can’t mistake the critic’s pompous voice and the moment we hear him speak again we know that he’s “the guy”. Once again they use a common Monk motive: concealing adultery. I haven’t done an official tally, but I think it’s even more common than greed as a motive to commit murder on the show. If you see a bright red “cable car” on Monk it’s fake and you’re not in San Francisco. The theater that Julie performs in is actually much further south at the Covina Center for the Performing Arts, but for this episode it’s known as The Vinton Street Theater. Inside Monk and Natalie wait for the show to begin. Natalie’s excited about her daughter Julie’s upcoming performance and Monk is squirming in the seat next to her. He doesn’t want to share his arm rest with her. Natalie recognizes the famous theater critic, John Hannigan as he enters and sits in the balcony. She nervously wonders why he is there reviewing a mere community theater performance. Monk is fairly happy, with two arm rests all to himself, but his satisfaction is quickly forgotten in light of a “nature alert”. “Mr. Monk, do you have to go to the bathroom?” Natalie asks him, as if he were a four-year-old. He argues that they should return home, but Natalie’s not budging so Monk takes the big step of visiting a public restroom. Julie sings beautifully. Later as they exit the theater, Natalie’s understandably proud of her daughter. When she sees Hannigan outside the theater, she talks loudly to Monk about Julie’s great performance, pretending she doesn’t know her. Monk tries to play along, but he isn’t very good at it. In any case, the critic pays no attention and walks away throwing an unopened pack of cigarettes and a lighter in the trash as he goes. Monk finds that odd, but he thinks no more about it when Julie comes out in costume as an old lady. Natalie tells her how wonderful and “poised” she was. Monk happily agrees. Julie goes off with the other performers to attend a cast party. Monk and Natalie start their walk home, but on their way they run into Stottlemeyer, Disher, and Callie Esterhaus’ corpse in front of the hotel. Stottlemeyer thinks she’s a jumper who “checked out early,” but when Monk wants to take a look at the crime scene he jumps at the offer. Monk investigates up in the hotel room. As he does his zen “hand thing” Officer Darden (Keith Robinson) gives him the rundown on the victim, a local waitress. Natalie smells cologne in the air, but none of the men are wearing any. Stottlemeyer notices that Randy is missing. Natalie has sent him out to get a newspaper with a review of Julie’s performance. “Who are you the new Police Commissioner?” he asks. Julie gets the bad news at the cast party. She’s a little upset, but she takes it a lot more stoically than her mother. Stottlemeyer, tired of Natalie distracting them from the investigation, tells her to go yell at the critic. Natalie takes his advice immediately and heads to the San Francisco Dispatch newsroom to confront Hannigan. He’s kissing his fiancée, who’s wearing the ring the killer was showing to Callie, when Natalie arrives. He’s unbelievably rude to her. She gives him a piece of her mind. A delivery man brings him a take out lunch from Winberries, where he eats on a regular basis. As Hannigan passes her Natalie catches a whiff of his cologne and recognizes it from the hotel room. She has a Monk-like revelation. You can see it on her face. He’s the guy. Without another word, she leaves. Natalie goes to the police station where Monk, Stottlemeyer and Disher are going over the case. She announces she’s solved it. Hannigan’s the guy. He’s wearing the cologne she smelled, he eats at Winberries, and his name starts with the later J. They’re understandably skeptical. He was at Julie’s show. How could he have done it? She tells them he must have snuck out and she has proof positive. She brings Julie in for a reprise of Away, after advising everyone to shut of their cell phones and unwrap any hard candy they have. Julie sings like an angel. “So let’s go pick him up,” says Natalie. Later while ironing his magazines, Monk gets a call from Natalie. She’s been arrested. Back at his apartment Natalie begs Monk to take on the case and he reluctantly agrees. They go to the theater where the manager, Mrs. Carruthers (Linda Bisesti), tells them that Hannigan usually sat in the fifth row center seat, not in the box seat. Monk discovers that the exit light by the box seat is out. It’s been unscrewed. Natalie guesses that in the darkness Hannigan may have replaced himself with “a mechanical man or robot.” Despite the fact that they recently had a case just like that (with Togo the egg eating robot in “Mr. Monk and the Lady Next Door”), Monk dismisses the idea and goes to wash up. In the Gentlemen’s room he has another chat with Gilson. Monk questions him about the box seat, the exit door, and if he thinks it would be possible to sneak out during a performance. Gilson asks about the investigation and Monk tells him about Natalie’s suspicions. Monk thinks she may be on to something. “Did you see anything that night?” he asks Gilson. “I don’t have the best view of the house,” Gilson replies, but as Monk leaves he looks troubled. Hannigan reassures him that there’s nothing to worry about, but at the first opportunity he conks Gilson on the head and shoves him into the trunk of his car. Bad, bad critic. Monk and Natalie and Monk rush to the hospital where Stottlemeyer tells them that Gilson is in a coma and asks how they know him. “He’s my men’s room attendant,” Monk tells him. “Okay,” says Stottlemeyer, because he’s learned better than to ask about things like that. Natalie hugs him. “I knew it!” she says triumphantly. Monk explains that Hannigan duped Gilson into taking his place in the box seat at the theater while he slipped out to kill his mistress. The trouble is they can’t prove it, but Monk has an idea. Later in the newsroom, Stottlemeyer confronts Hannigan on what he tells him is an entirely different matter as Monk and Natalie stand near by. Disher escorts Julie in. “That’s him,” she says. They reveal that Julie is Natalie’s daughter. Stottlemeyer explains that by admitting he’s never seen her Hannigan has proven he wasn’t in the theater during her performance and he’s incriminated himself. “I think I need to call my lawyer,” Hannigan admits. Later Julie gets a letter from the Dean of Admissions at Cal State Berkeley. (Of course, there is no Cal State Berkeley, unless you live in Monkland. It’s UC Berkeley.) She and Natalie are too nervous to open and read it so they let Monk do it in his own unique style. It takes a while, but Julie finally learns she’s been accepted. She and Natalie leave to celebrate as Monk continues to read the letter at his own pace.